Fans of Milo Yiannopoulos were plotting to get back at liberals, antifa and even the local police on Thursday night after the alt-right figure announced the sudden cancelation of a speech he’d planned to give at a venue in Arizona. The trouble began when Yiannopoulos posted a message on Facebook about 24 hours before the March 2 event, “A Night With Milo,” was scheduled to take place. Organizers had kept the name of the venue a secret while selling tickets to fans for as much as $129. They promised to reveal the location the day of the speech. “URGENT NOTICE TO PHOENIX TICKET-HOLDERS,” his note said. “Scottsdale Police informed the promotor and venue for Friday night’s ‘A Night With Milo’ this evening that a credible death threat against my person has been received,” Yiannopoulos wrote. He went on to blame “violent left-wing tactics” for the cancelation, but said that law enforcement in the ritzy Phoenix suburb of Scottsdale had determined his security had been compromised and the risk to his life was real. There was a problem, though: Scottsdale police said they’d never received word of any threats against Yiannopoulos. In fact, Sgt. Ben Hoster of the Scottsdale Police Department told Phoenix talk radio station KTAR that the department had only learned of the event earlier on Thursday. And by the time someone from the department reached out to the venue, the speech had already been canceled. “At that point, we concluded our inquiry into the event,” Hoster told KTAR. The blame game had already begun, though. Yiannopoulos’s fans spent hours on Facebook page looking for a culprit. Someone other than Yiannopoulos, of course. Antifa groups were behind this, they claimed. Or else leftists, commies or liberals. Perhaps the police were lying, they speculated. Or the journalists who quoted the police. A person using the name Zach Young had an idea, which he posted in a since-deleted thread on the event’s Facebook page, to solve the problem. He heralded the late Chilean dictator Augusto Pinochet, whose regime tortured and killed opponents, purged those with left-leaning views and instituted an authoritarian government. Other users, like Beth Stanard, told fellow fans to flood the police department with phone calls. Yiannopoulos had conveniently posted the phone number for the department in his announcement about the cancelation. 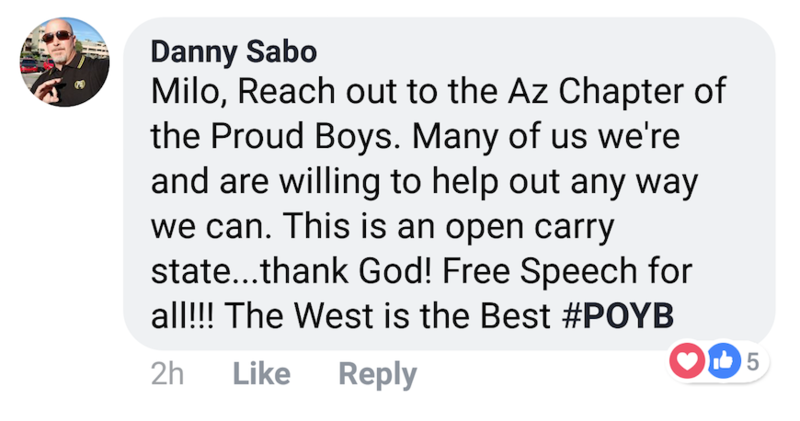 Yiannopoulos was also encouraged by someone using the name Danny Sabo to reach out to the local chapter of the Proud Boys, a hate group that has denied any connection to the alt-right. Sabo noted Arizona is an open carry state for guns. The national founder of the Proud Boys, Gavin McInnes, also posted a message on Twitter saying "the left" was to blame for the cancelation. "They want a war," McInnes wrote. But soon, Yiannopoulos started shifting his story. Initially he blamed the Phoenix radio station, accusing it of getting the story wrong. A short time later, though, Yiannopoulos turned the blame to the venue, simply named The Venue Scottsdale. He had come to believe the company that runs the space lied to him about the supposed threats. It was the third time in recent months that a Yiannopoulos event had been canceled in Arizona. Following the previous two cancelations, Yiannopoulos also blamed threats of violence from liberals. The Southern Poverty Law Center contacted The Venue Scottsdale on Friday seeking a response to Yiannopoulos’ accusations. A man who took the call and only gave his name as Dan said, “I don’t know anything about it. It’s completely out of my area.” He suggested calling a number with a California area code. A message at that number was not immediately returned.